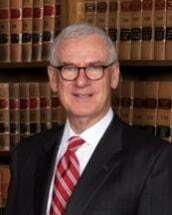 Mr. Frank Thigpen is a partner with the Law Firm of Thigpen & Jenkins, LLP. Mr. Thigpen began practice in 1972 in Robbins, North Carolina, and later in 1993 merged to form the Firm of Thigpen & Jenkins, LLP. Mr. Thigpen and his staff have helped thousands of individuals throughout Moore, Montgomery and the surrounding counties in an array of legal issues. The firm has expanded and includes three offices located in Southern Pines, Biscoe, and Robbins, North Carolina. Each of these offices serves the surrounding counties in the piedmont of North Carolina including Randolph, Richmond, Stanly, Hoke and Lee Counties. Mr. Thigpen was born in 1945 and raised in Pikeville, NC. He graduated in 1968 from High Point University with a degree in History and Political Science. Later, he graduated from UNC School of Law in 1972. Shortly after that, Mr. Thigpen opened an office in Robbins, North Carolina, where he had a general practice and represented clients in criminal, family law, personal injury, worker’s compensation, business law, and real estate transactions. In recent years, however, the firm has moved towards a greater degree of specialization and Mr. Thigpen has primarily devoted the majority of his time to Family Law, Civil Litigation, and Real Estate closings & transactions. Mr. Thigpen is a member of the North Carolina Bar Association as well as a member of the North Carolina Advocates for Justice. Mr. Thigpen has been married to his wife, Lynne, since 1968 and they have three grown children and are the proud grandparents of 9 grandchildren. He is a member of Southern Pines United Methodist Church where he has served for the past several years as Chairman of the Board. In his spare time, Mr. Thigpen enjoys traveling and spending time with his wife, children, and grandchildren.